These bamboo legs are made from ordinary garden stakes. 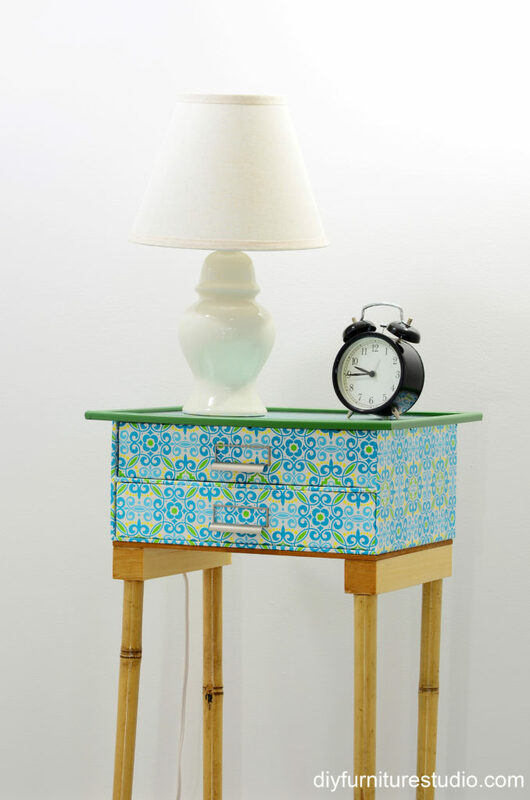 I paired them with a fiberboard drawer unit to make a nightstand. I bought this fiberboard drawer unit at the Container Store for about $20. It’s designed as an organizer for papers. 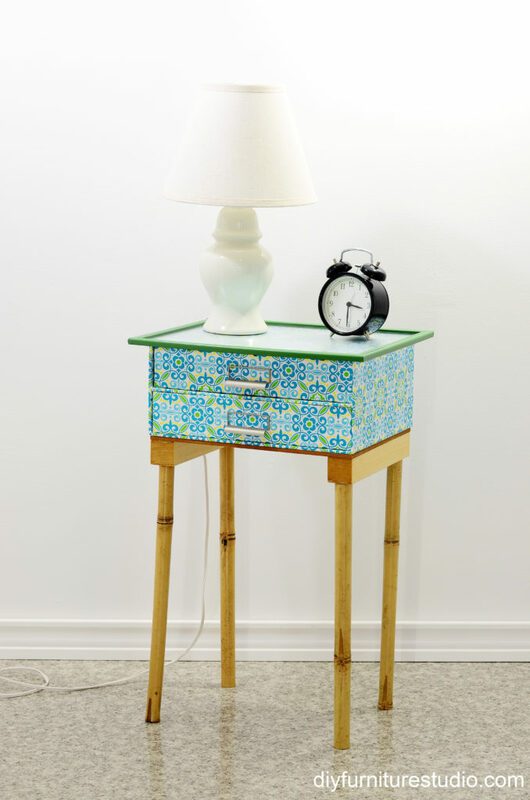 You can find this type of drawer unit in different colors and patterns at many stores. 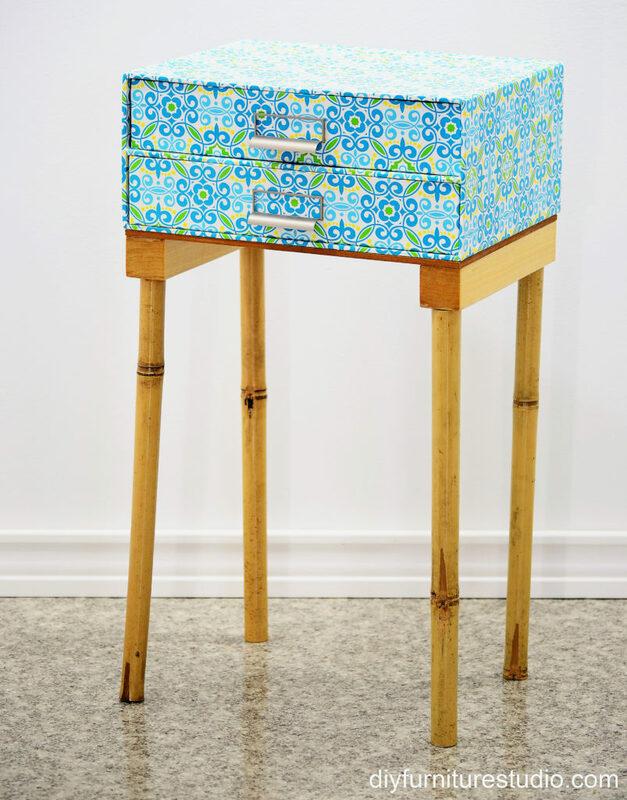 If you want something more durable, look for similar drawer units made of steel or wood. The legs were made from bamboo garden stakes and cost less than a dollar each. Typically, nightstands are about the same height as the top of the mattress on your bed, but you may like yours higher or lower than that. I decided I wanted my nightstand to be 23 inches tall. My paper drawer was 5 1⁄2 inches high, 10 inches wide, and 13 inches long. As you read through these instructions, be sure to make adjustments to the measurements to fit your situation, specifically the length you want your legs (which varies depending on the overall height you want your nightstand and the height of your drawer unit) and the bottom dimensions of your paper drawer. As we go along, I’ll point out at the appropriate steps when you may need to cut things at a different length or to different dimensions. First, I cut a 10″x 13″ piece of 1⁄4” thick hardboard for the base. Cut yours according to the size of the bottom of your drawer. I used hardboard that was tempered (smooth) on both sides, but one-sided is fine. 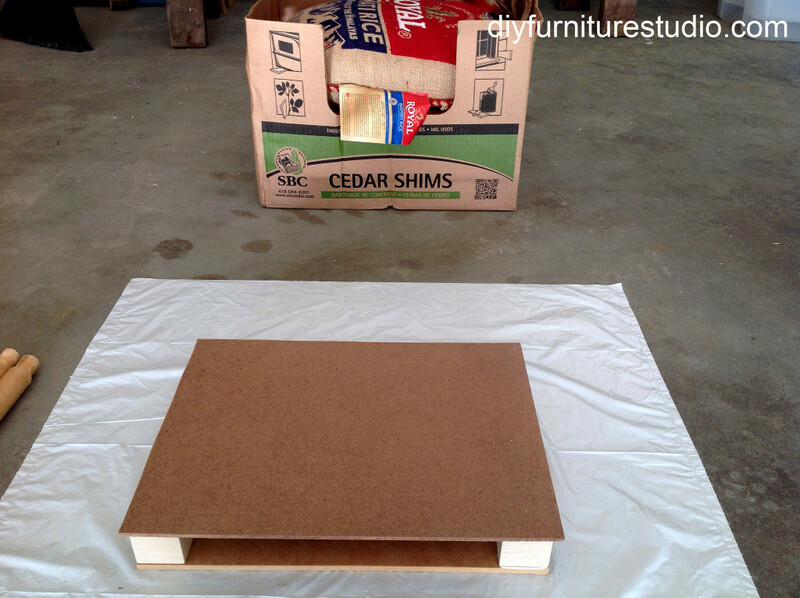 Just face the rough side to the drawer, and attach the legs to the smooth side. The four-foot long bamboo plant stakes I used for the legs were about 1″ at the wide end, down to about 1⁄2” at the small end. I bought these at Menard’s for about $1.50 each. Before you buy, look the stakes over good and avoid any with cracks. I cut a total of four 16″ sections of bamboo for the legs. Because I wanted all the legs to be about the same diameter, I cut two 16″ pieces from the wider end of each of the two 4′ stakes. Here is the place where you need to figure out how tall you want your nightstand, because you might need to cut your bamboo to a different length, not 16″ like mine. I wanted the overall height of the nightstand to be 23″. My drawer unit was 5 1⁄2” high and the leg supports added 1 1⁄2“. So I subtracted 7” (5 1⁄2” + 1 1⁄2“) from 23″ to get the length I needed for my legs (23″ – 7″ = 16”). The bamboo stake is hollow, except for joints. 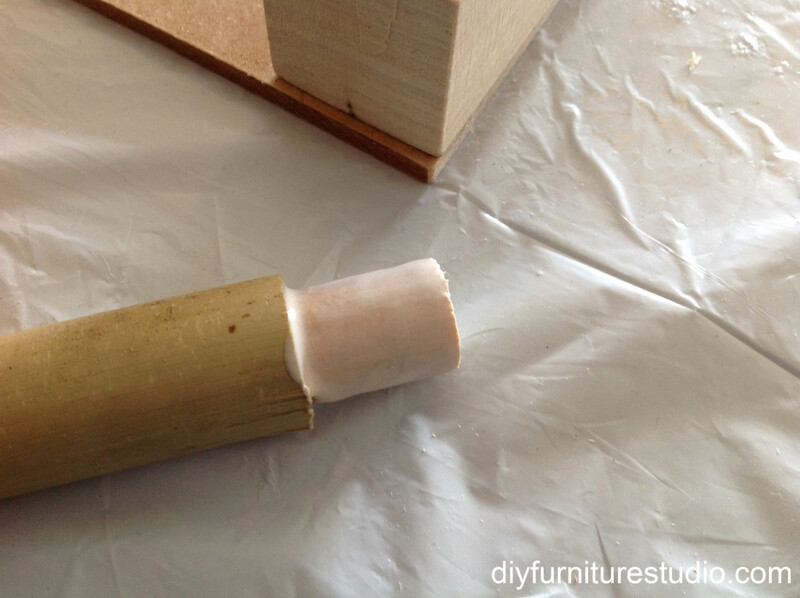 You’ll be gluing a tapered dowel piece into the hollow in the larger end of each bamboo leg. 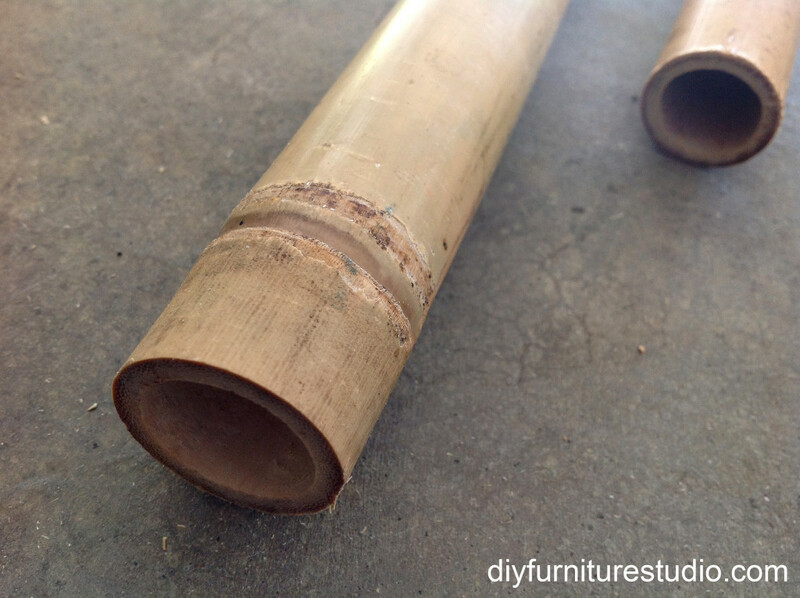 If there is a joint near the end of the bamboo piece, you will need to drill this out first. I used a 1⁄4” drill bit and drilled into the joint several times to clear it, avoiding the side walls. 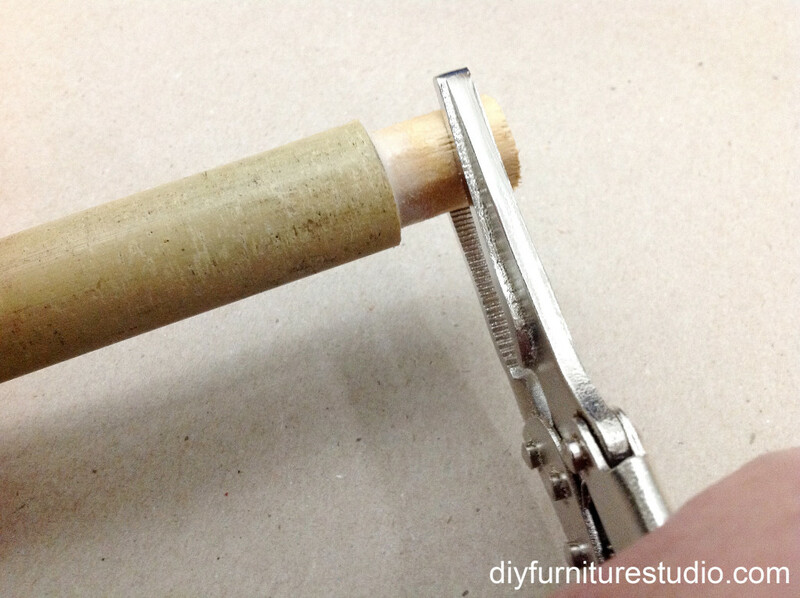 For the peg, choose a round dowel that just barely fits in the hollow (or is slightly bigger), and taper the dowel by sanding as needed to fit tightly. In my case, I used a 5⁄8” round dowel rod for all the legs. I measured the diameter of the center holes and bought a dowel rod closest to the diameter of the largest one. Because the center hole of the bamboo varied from piece to piece, some needed more tapering than others. In the photo below, note how I positioned the palm sander. When I was sanding, I put more pressure on the end portion of the dowel, and I rotated the dowel periodically to taper all the way around. After tapering, cut off a section 2″ long. Repeat. Make four total. Now you will glue the pegs into the bamboo pieces. 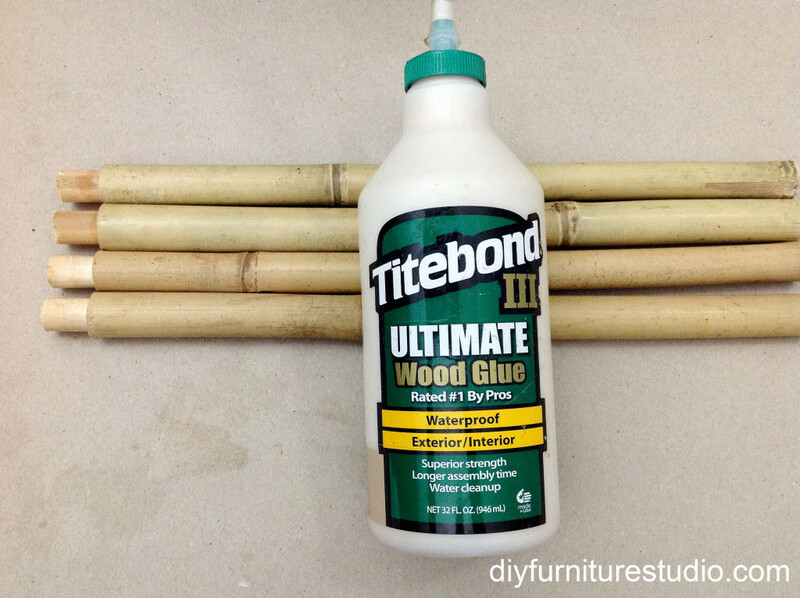 Use Titebond 3 or another wood glue. 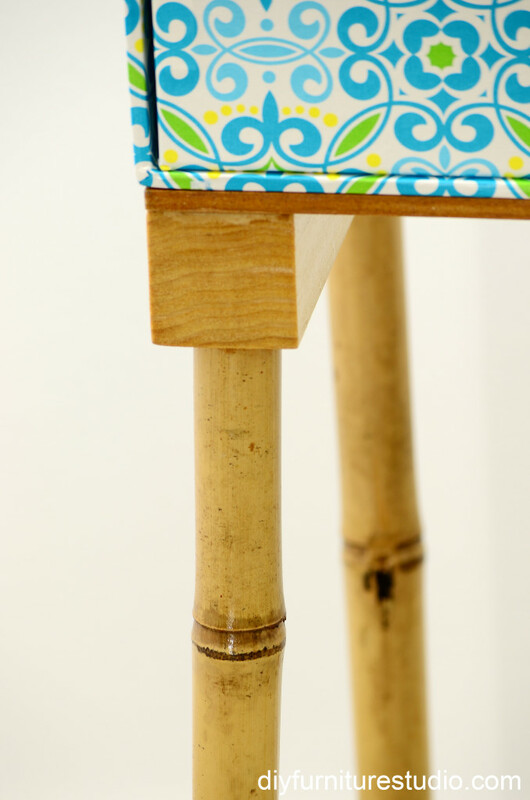 Put a generous amount on the tapered portion of your dowel pegs, and insert the tapered ends in the bamboo with the non-tapered end sticking out. Have some locking pliers handy to help insert and position the pegs so that about 1″ sticks out the ends. As a preview, the peg of the bamboo legs will be glued into square wood pieces, which I’ll call leg supports, for lack of something better to call them. 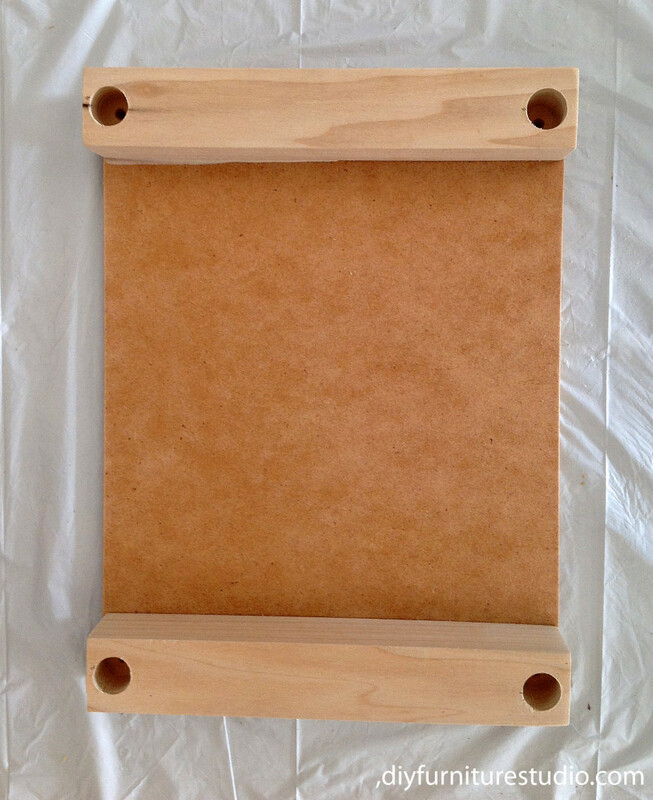 Below is a photo of the two leg supports and the hardboard base. 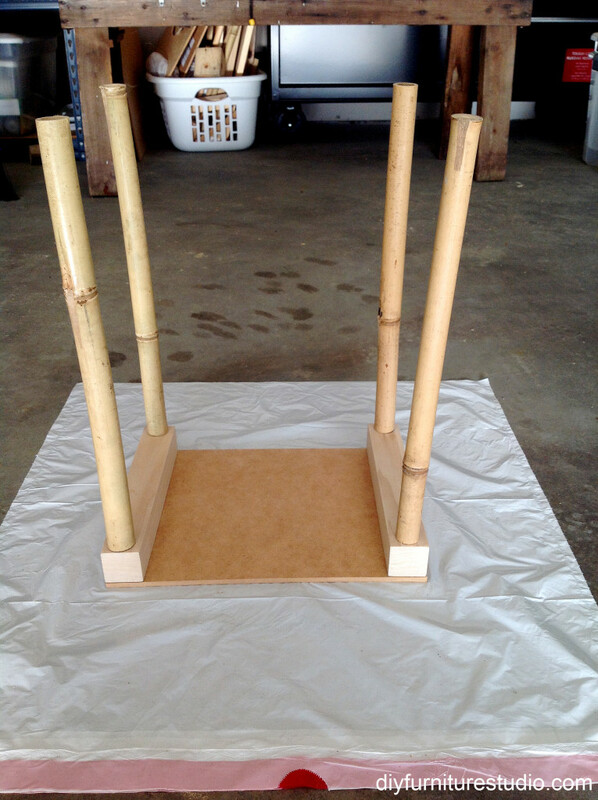 After gluing the leg supports to the hardboard, the bamboo legs will be glued to the leg supports. 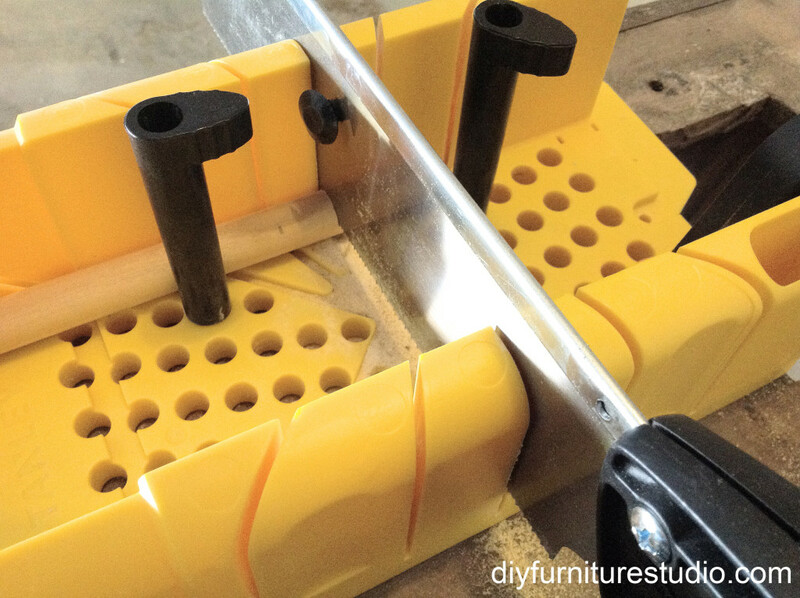 You have already cut the hardboard base, so now I’ll show you how to get the leg supports ready. 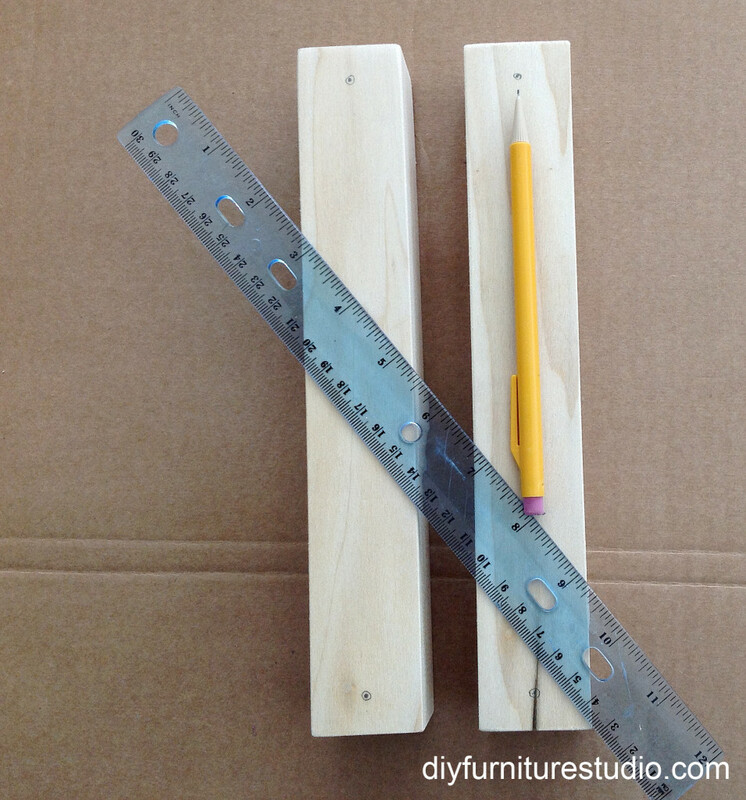 For my nightstand, I cut two 10″ long pieces of 1 1⁄2” x 1 1⁄2” square wood dowel for the leg supports. 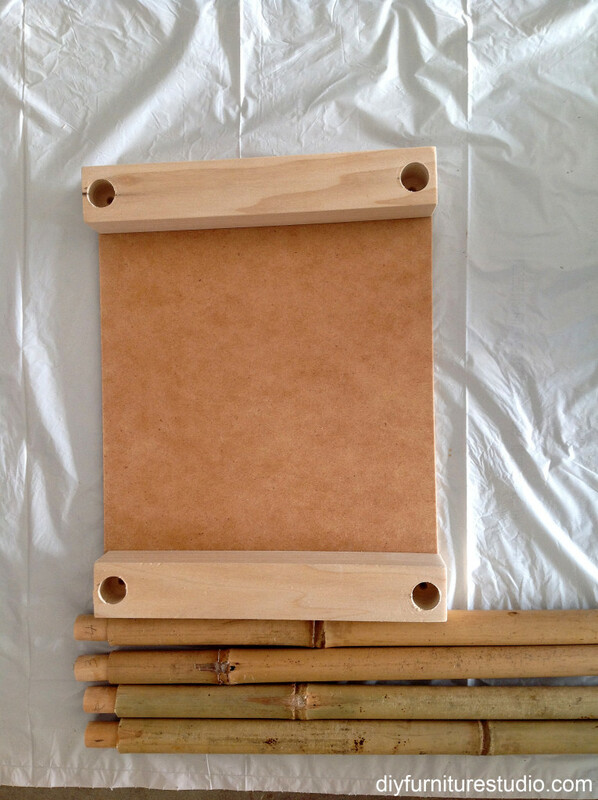 You could use a square dowel, a 2″ x 2″ furring strip (which is actually 1 1⁄2” x 1 1⁄2“), or similar wood. 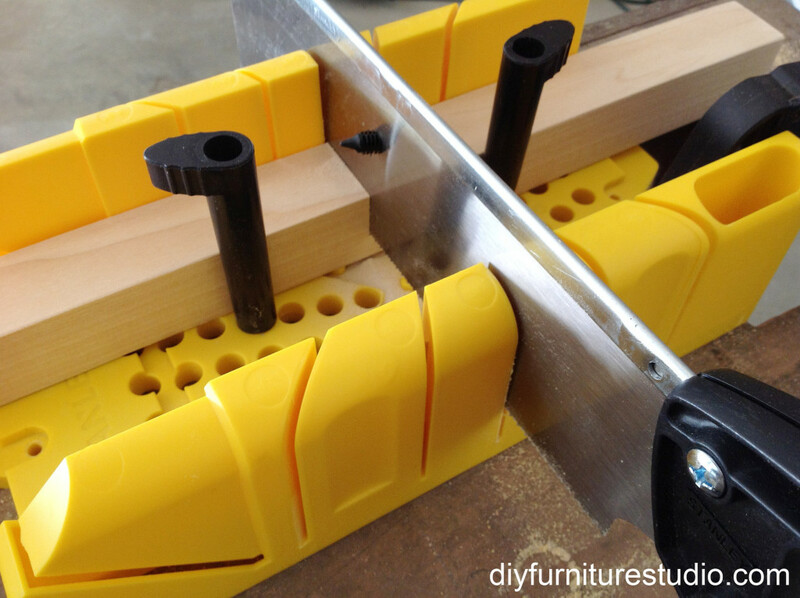 The leg supports should be cut to the front-to-back dimension of your drawer unit, that’s why I cut mine to 10”. 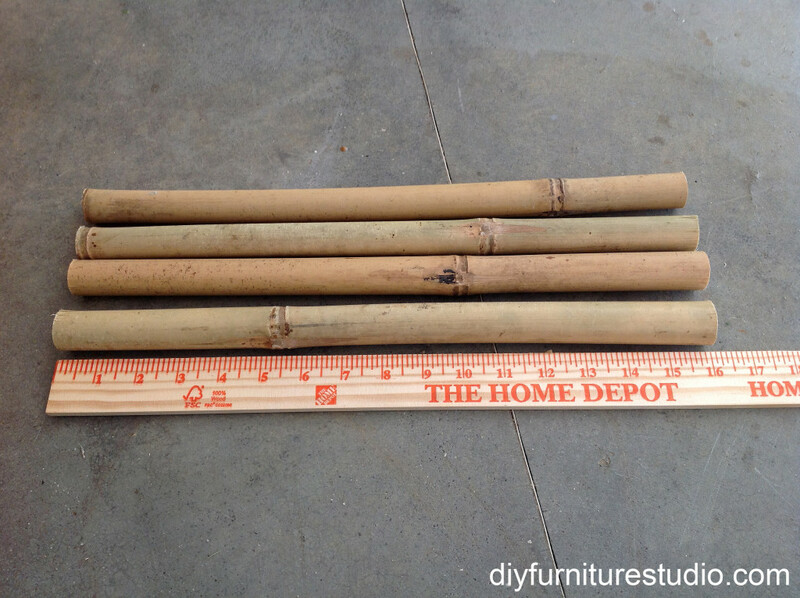 If your bamboo stake has a diameter larger than 1″ diameter, use larger square wood for the leg support. After cutting, I gave these pieces a once over with the palm sander and fine sandpaper. 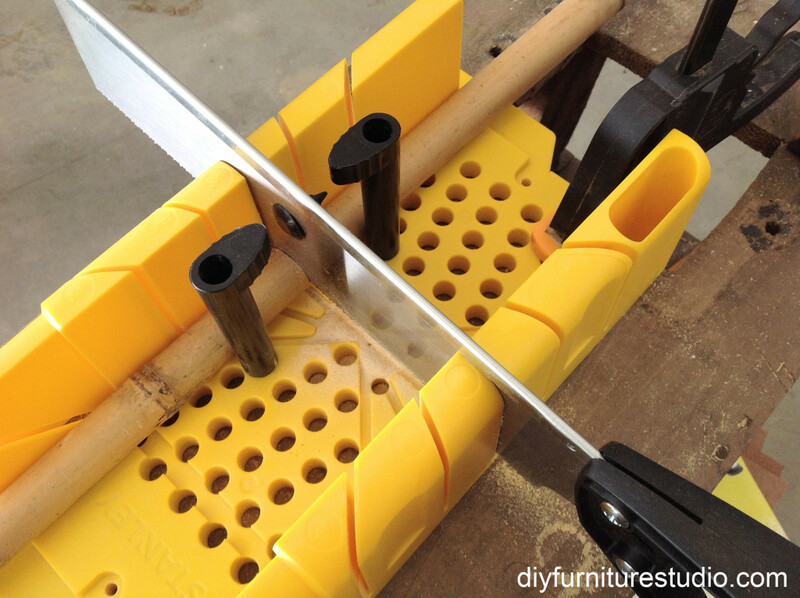 Next, drill holes in the support pieces where you will later glue the pegs of the bamboo legs. I marked the wood in the center about 1⁄2” from the edge. If your bamboo stakes are larger than 1″ diameter, you’ll want to drill the holes further away from the edges. 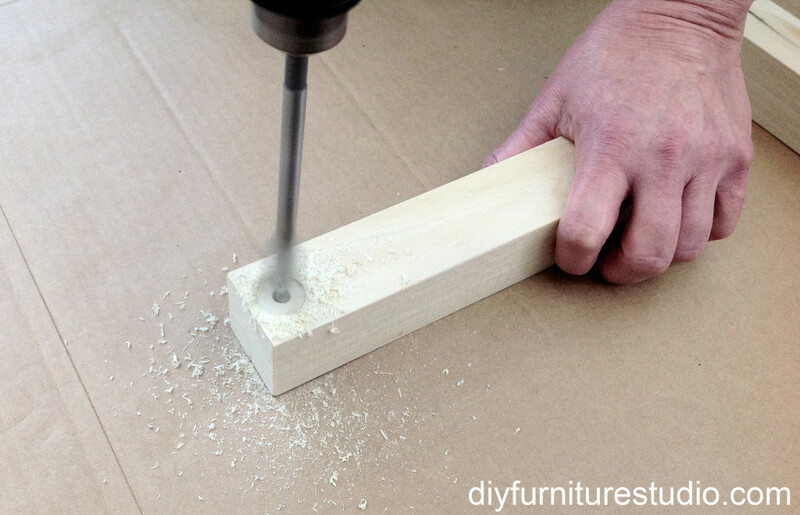 Use a spade drill bit that matches the diameter of your dowel peg (5⁄8” for mine). I alternated drilling a little then dry-fitting several times to get the right depth and tweak the diameter of the hole. 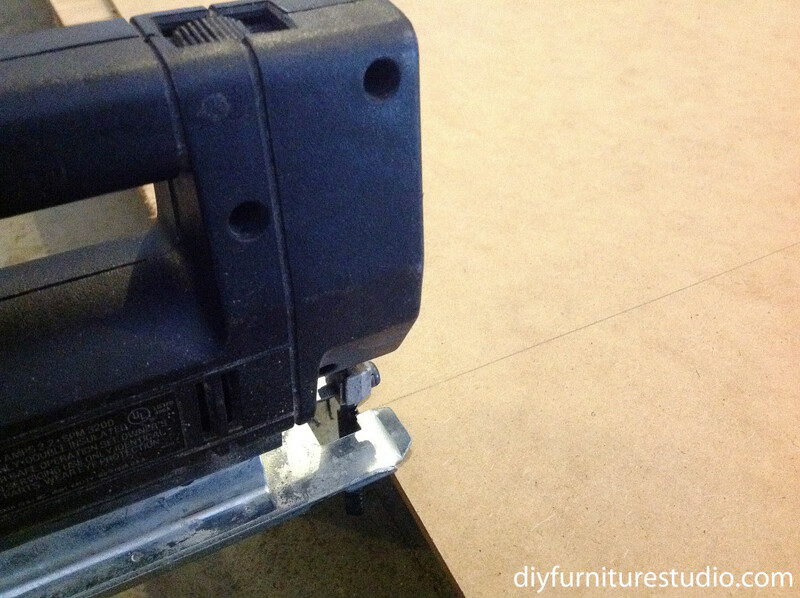 As you are drilling the holes, you might need to stop and tip the wood over at times to clear wood shavings. 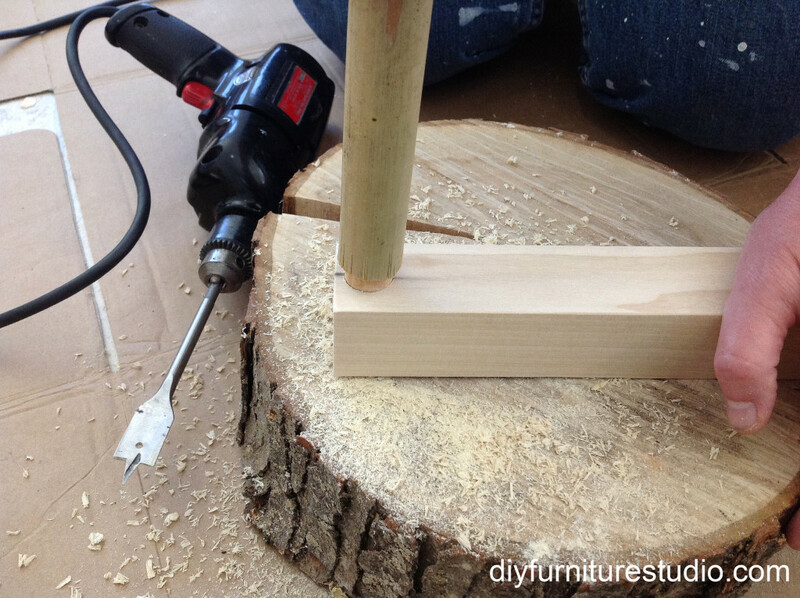 You will want to drill the hole as perpendicular, or straight, as you can. 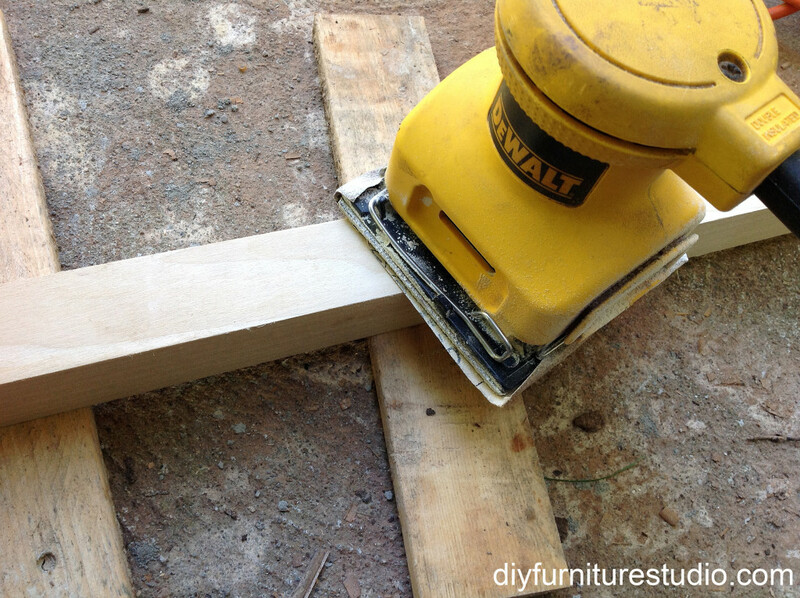 This would be easy to do if you have access to a drill press, and if you do, use it! But I don’t, so I did the best I could. One advantage to doing this project with bamboo is that the bamboo itself is not straight so I can get away with having mounting holes that are not perfectly perpendicular. Now you are ready to assemble the legs and base. 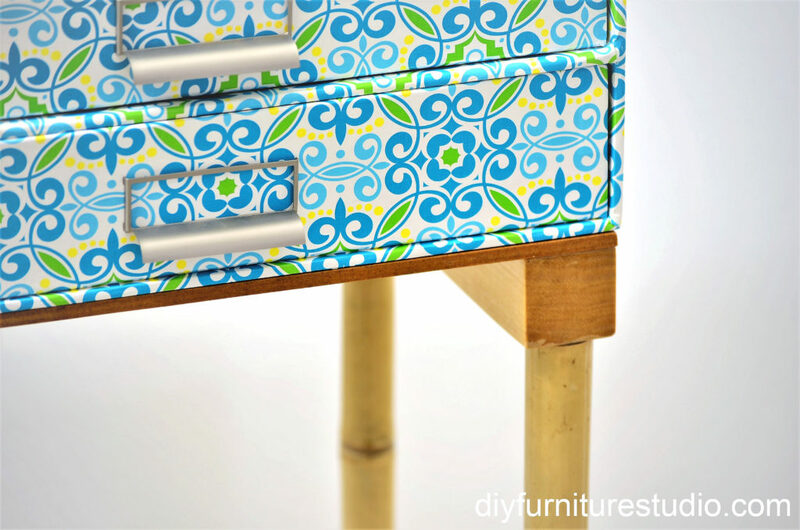 The bamboo legs are by nature not uniform, and I think this adds to the charm of this piece of furniture. I put the legs into the leg supports without glue and gingerly set the hardboard base on top. This was a two-person job and a little awkward. I fussed with the leg position, turning the leg supports around and putting the legs in different holes, until I was happy with how it looked–a little wonky, in a good way. I then numbered each leg and the corresponding hole so I could easily position them later when gluing them in place. 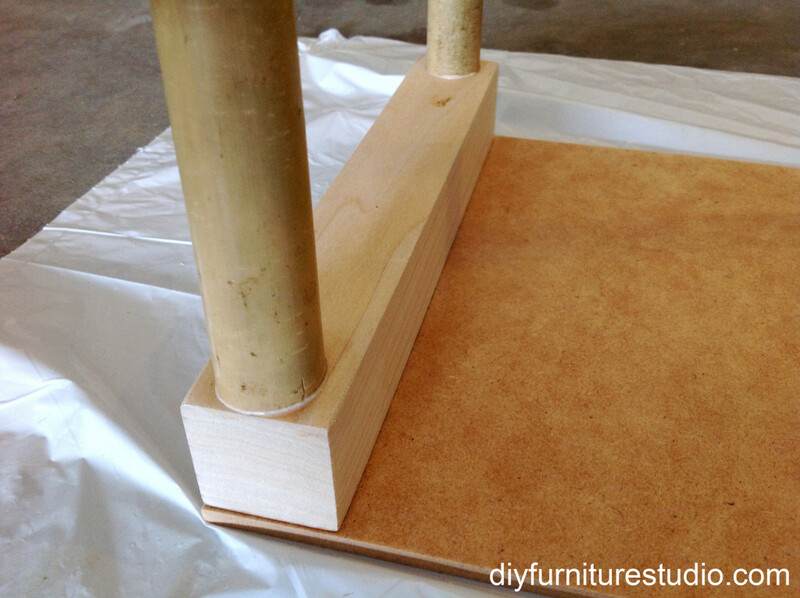 Glue the leg supports to the hardboard using Titebond 3 (or another wood glue). Spread the glue on, then to get a good bond, add weight while the glue is curing. Before I added weight, I put a scrap piece of hardboard on top of the leg supports to distribute the pressure. 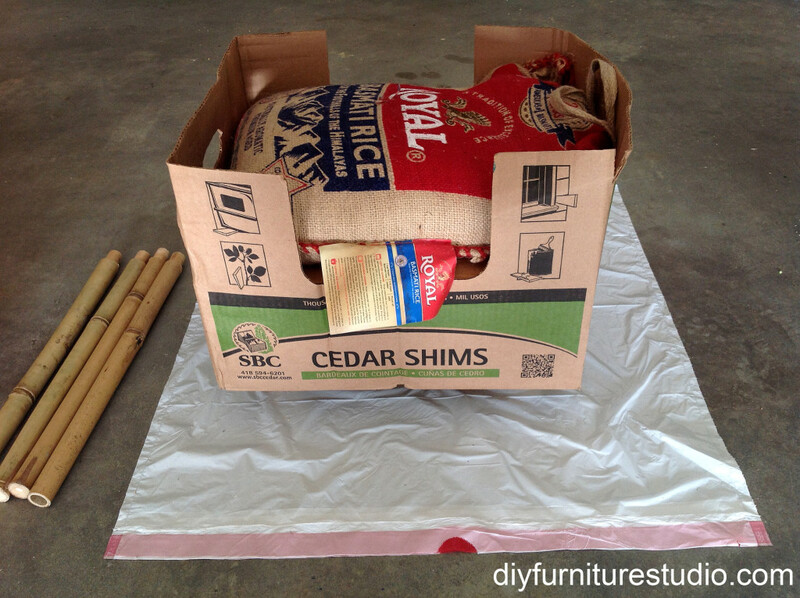 I then put a box loaded up with a bag of rice and wood shims on top of the scrap hardboard for weight. Let this sit for at least 5 hours, and more is better. Follow the instructions on your glue. Now you’re ready to glue the bamboo legs in place. 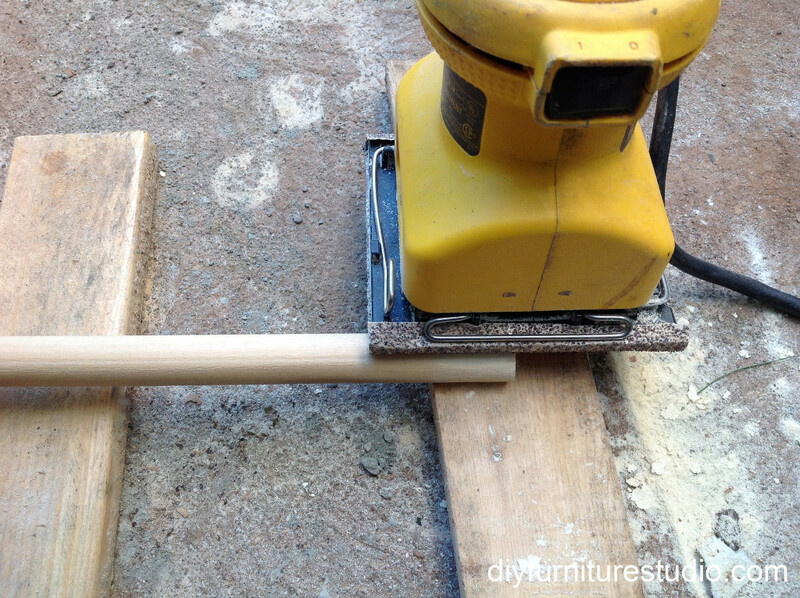 Spread a generous amount of glue on each dowel peg and insert into holes. 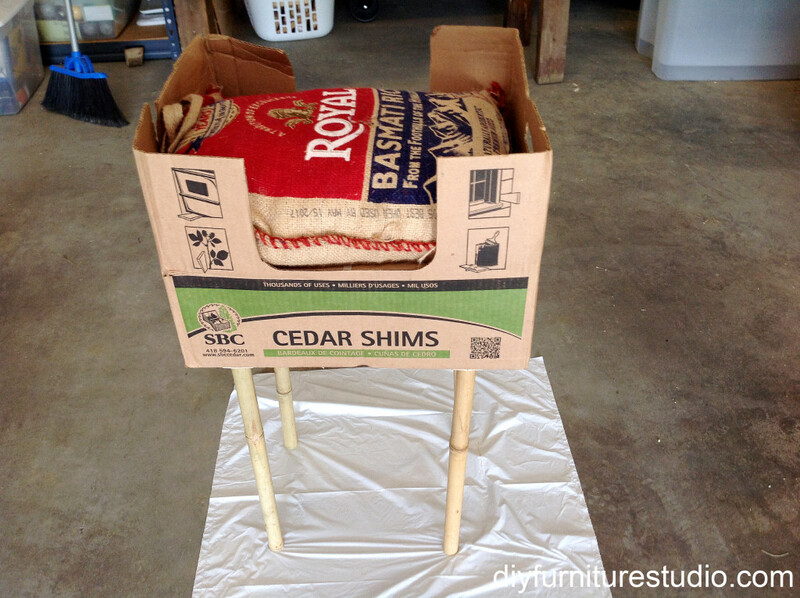 After getting the legs in place, I turned the base/legs upright and weighted it with my box of wood shims and rice. After getting the legs and base together, I applied a couple of coats of Minwax Wipe-on-Poly (satin) as a protective finish. I applied this with a piece of an old t-shirt. A protective finish is probably not necessary, but a good idea. There are many kinds of clear protective finishes that would work, including shellac, varnish, any kind of polyurethane. Some of these come in spray forms, which you might prefer. 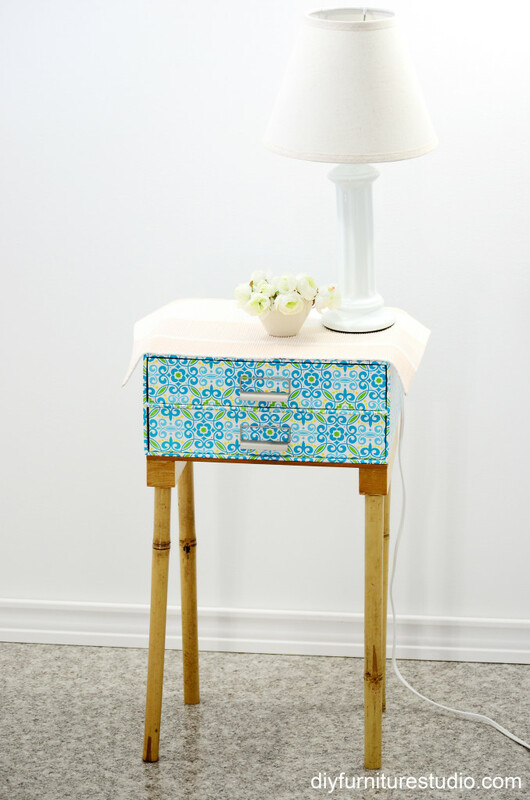 The only thing left for the basic nightstand is to attach your drawer to the legs/base. I’ll tell you a secret. 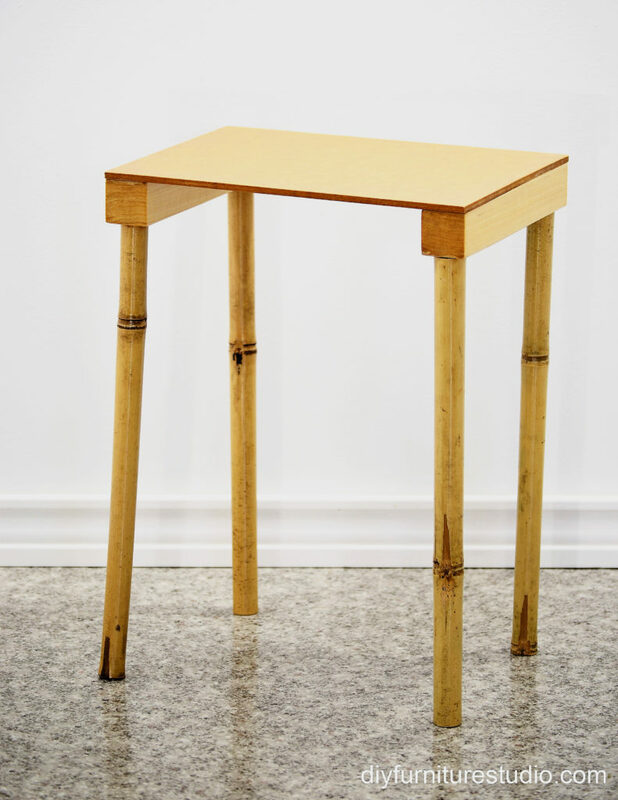 I didn’t attach mine yet because I’m planning to show you two more versions of side tables using this base and bamboo legs. So check back in a few weeks for these. 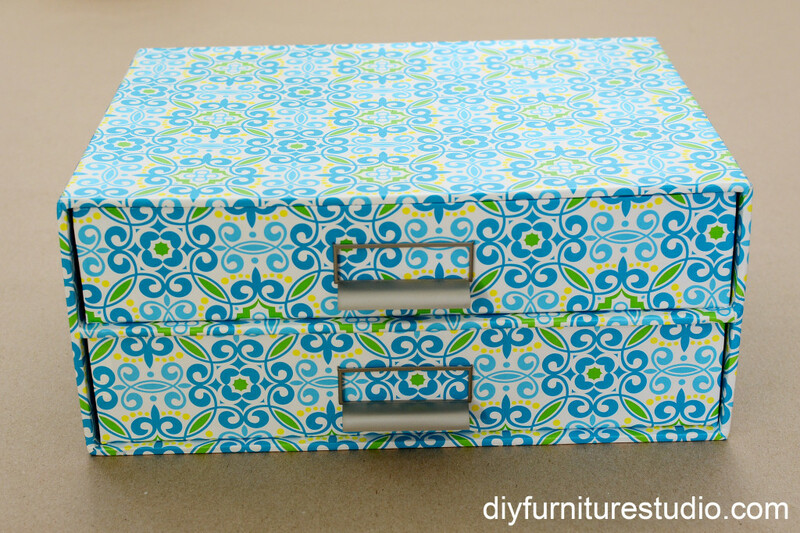 To attach your drawer unit, use carpet tape or wood glue. I’ll do this eventually. 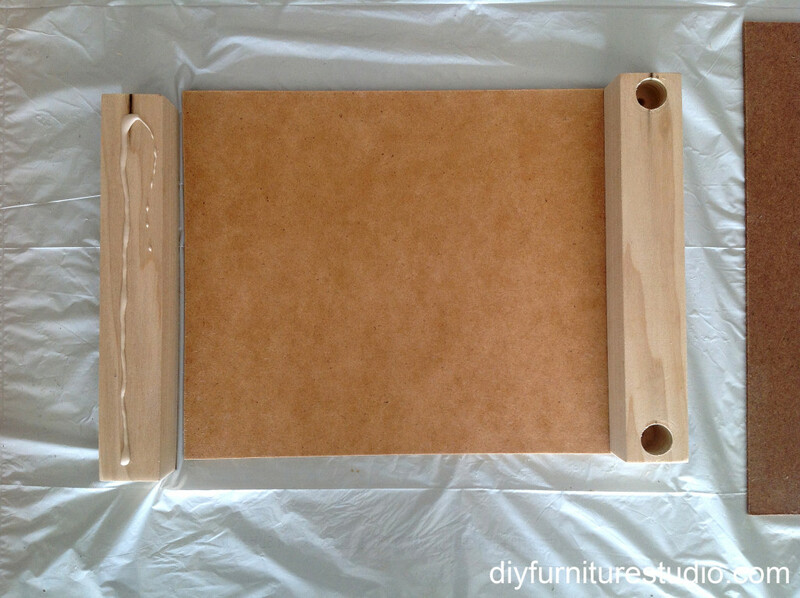 You might like a topper for your nightstand to give it a little more surface area for your things and to protect your drawer unit, especially if it is made of fiberboard like mine. 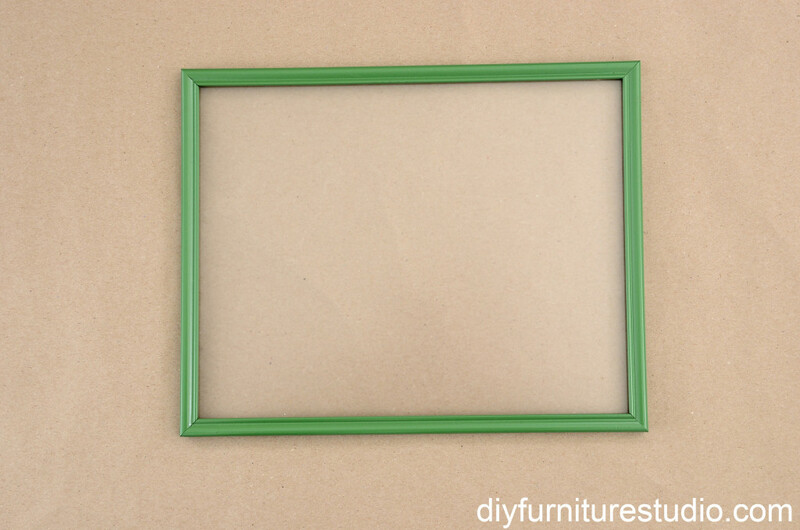 I’m always looking for the more affordable (okay, cheap) options, so I made mine using an 11″x14″ $1 picture frame that I bought at the Dollar Store. The picture frame came with a thin piece of non-tempered glass. For safety reasons, I suggest replacing this with tempered glass or clear plastic. 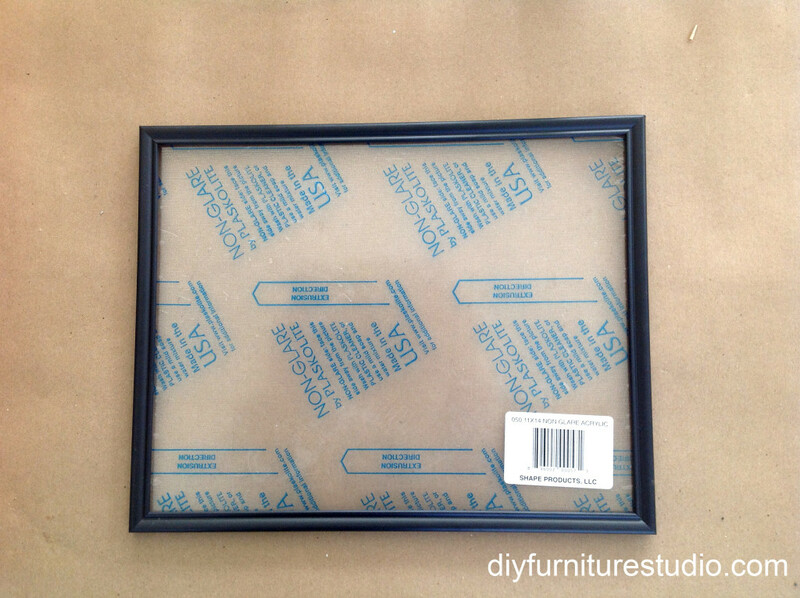 After spray painting the frame, I bought an 11″x14″ clear acrylic sheet at Menards and popped it in. If you want to attach the topper to your drawer unit, use a clear glue such as Seal-All. Now go make some furniture! Please feel free to drop photos in the Comments Section to show everyone what you’ve been up to. Questions? Ideas?